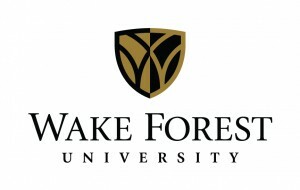 The Wake Forest University signature and the interlocking “W” shield are registered trademarks of Wake Forest University. For permission to use the marks on merchandise and apparel, email Michael Odom, Collegiate Licensing Company. Each school within the University has its own logo lockup in both a stacked and horizontal version. 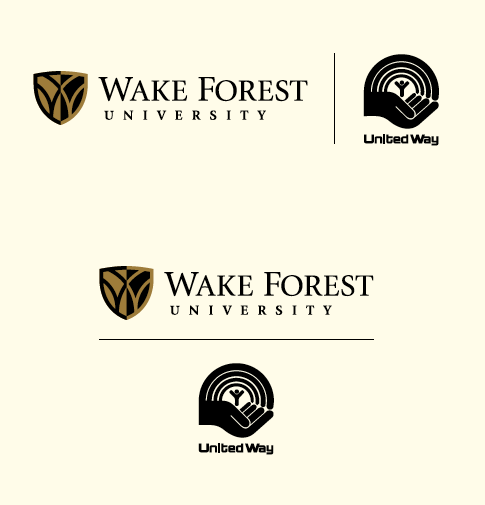 In these logos, the school name falls below a thin line underneath the Wake Forest logo. School logos have been prepared as digital art. Do not attempt to re-create a logo. 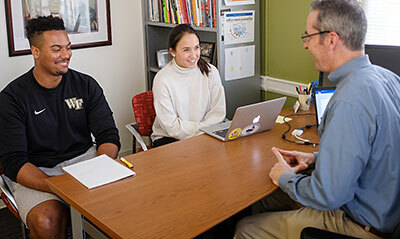 The Wake Forest University logo may include a department descriptor if the department is a University wide or administrative department or if the department spans undergraduate and graduate schools. School logos may also include a department descriptor. Logos with department descriptors must be approved and provided by Creative Services (Reynolda Campus) or Creative Communications (Bowman Gray Campus). Adding a department descriptor independently is not permitted nor is designing your own departmental logo. 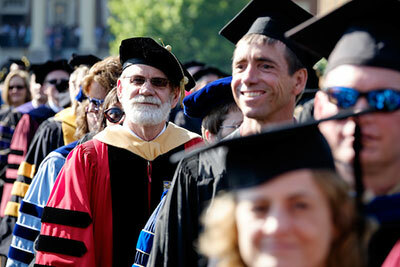 Download a Reynolda Campus logo with department descriptor. The legibility and distinction of our University logo is very important. To ensure that the logo is highly visible, always separate it from its surroundings. 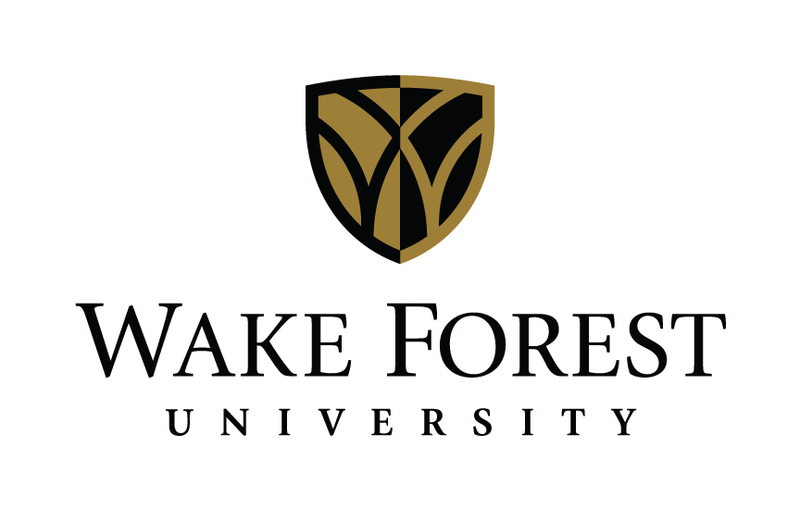 The area of isolation, or clear space, surrounding the logo should equal the height of the “W” in “Wake Forest.” Do not allow any other graphic element to penetrate this area of isolation. 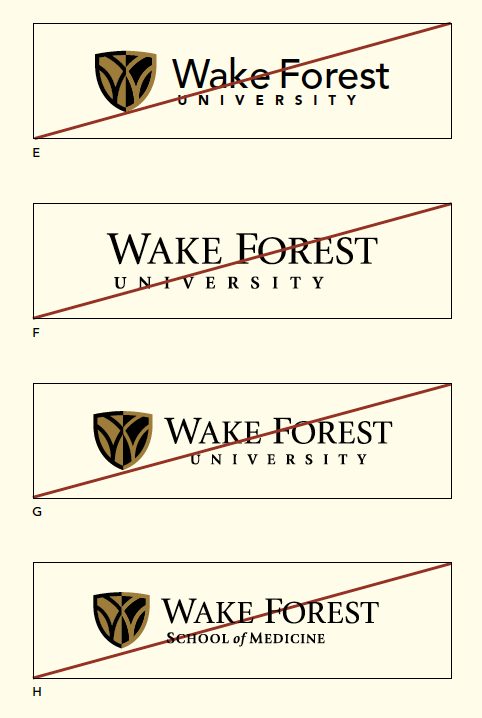 There is a minimum size for reproducing the Wake Forest University logo. This ensures that our logo remains legible in every usage. Never reproduce the logo smaller than the minimum size. These minimum sizes apply to all University logos, both for print and online usage. 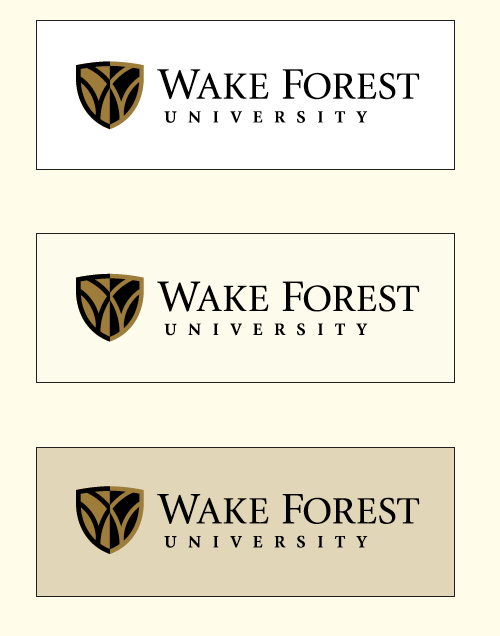 The logos shown are the permissible color versions of the Wake Forest University logo. 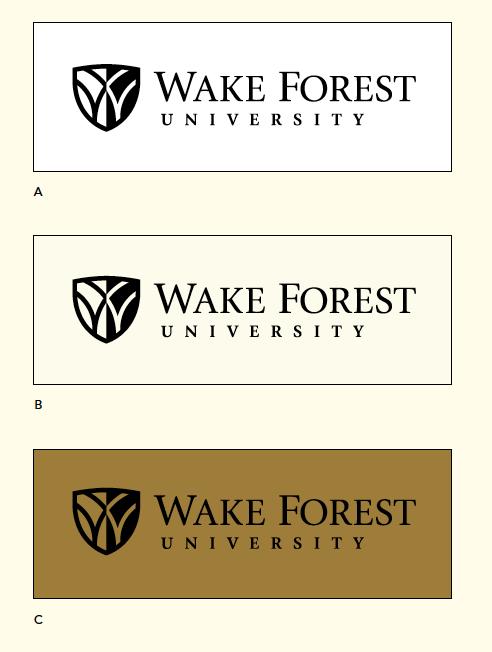 Whenever possible, use a version of the logo which includes both of our primary colors, Wake Forest Gold and black. This includes the full-color version on a white or neutral background (see the Neutral Palette section), the Wake Forest Gold version on black or the black version on Wake Forest Gold. When printing restrictions do not permit use of both primary colors, use the black one-color logo on a white or neutral background or the white logo reversed out of black. 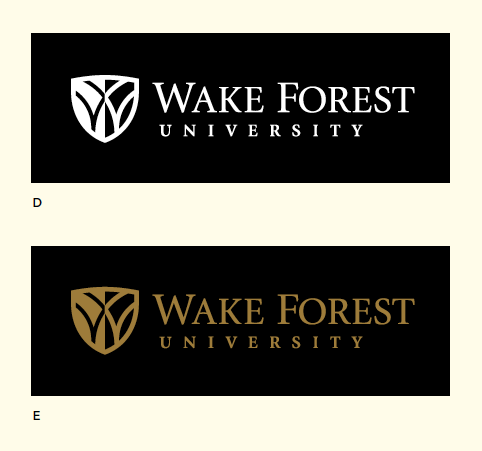 On black backgrounds, it is preferable to reverse out the Wake Forest Gold logo. If two colors are not available, the logo may be reversed out in white. The full-color logo may only be used on either a white background or on a color specified in the Neutral Palette section. 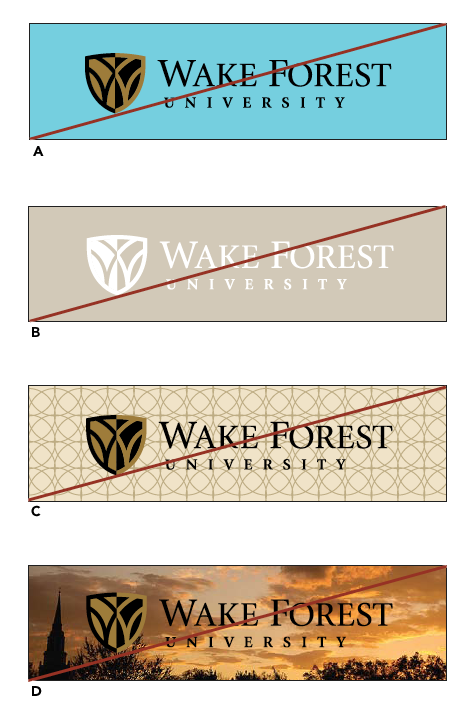 The examples shown represent incorrect usage of the Wake Forest University logo on different backgrounds. A | Do not use the two-color logo on any color that is blinding. B | Do not use the white logo reversed out of pale background colors. C | Do not use any version of the logo on top of a patterned background. D | Do not use any version of the logo on top of a photograph. 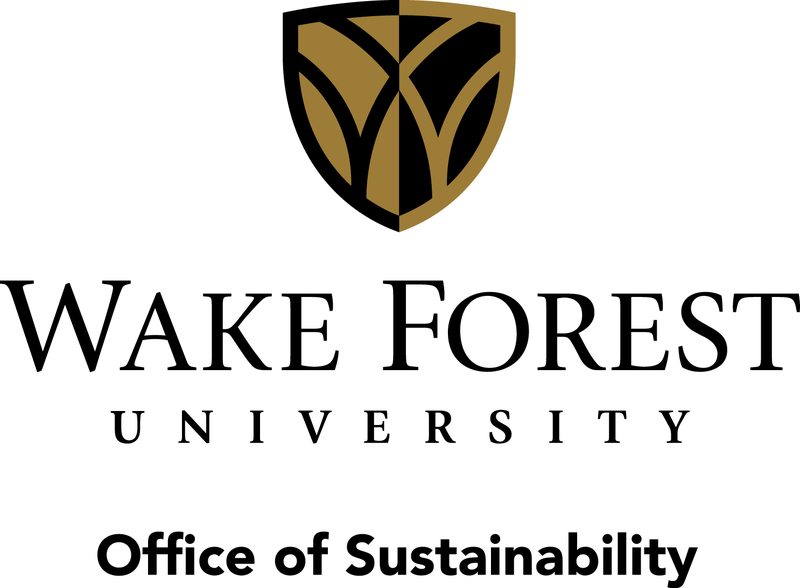 The shield may be used without the “Wake Forest University” type in place of the full logo in certain situations. The shield should never be used as a pattern, or in combination with another symbol to create a new logo. 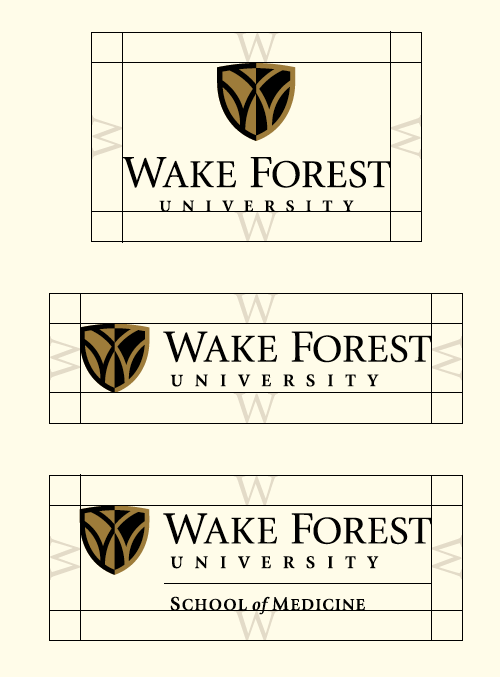 On collateral pieces, the shield may be used alone as long as “Wake Forest University” appears elsewhere on the piece, preferably as the complete logo. If you have questions about whether your application is acceptable, please contact Communications and External Relations. 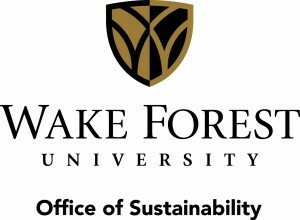 When using the Wake Forest University logo with another logo, such as for a co-sponsored event, observe the area of isolation for the Wake Forest logo, and center a .25″ rule between the two logos. The logos may appear side by side or stacked, depending on space restrictions. Use only the horizontal version of the Wake Forest logo. 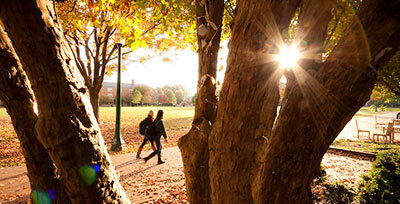 Wake Forest University Athletics logos may be used for communications related to athletic events. 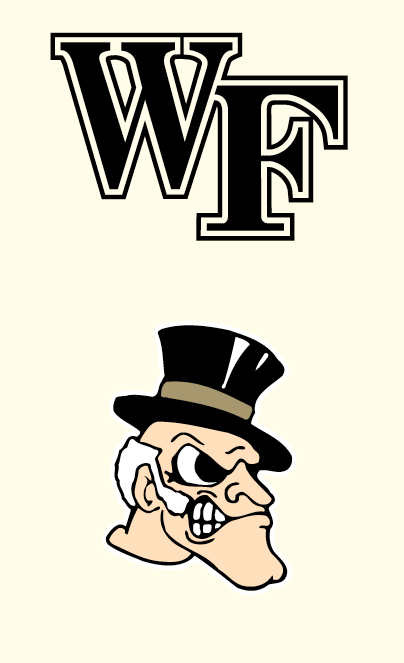 Both the bold block WF and the Demon Deacon are official athletics logos. These logos are for use only with materials related to athletic events. For all other communications, use the Wake Forest logo. 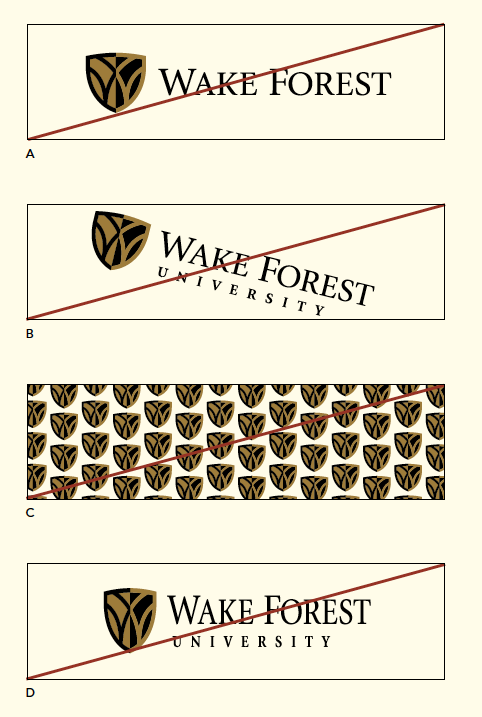 For graphic standards and information about the Wake Forest Athletics logos, visit wfbrandstandards.com. The Wake Forest University seal, designed in 1908 by William Louis Poteat and his predecessor, Charles E. Taylor, represents the rich heritage and history of our University. Inscribed with the words Pro Humanitate, it is a classic icon symbolizing our University’s vision to serve mankind through the pursuit of knowledge. The seal is to be used only for official documents and occasions. It must not be used as a casual logo or identity, a design element in recruitment materials or a decorative element. 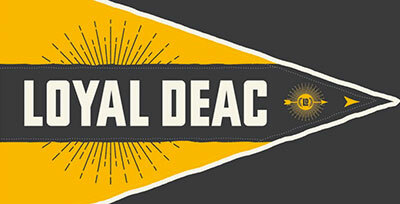 Ideally, the seal should be reproduced in Wake Forest Gold, either on an approved neutral background color or on black. The seal may also be embossed, foil-stamped or used as a watermark. If necessary, the black version of the seal may be used on an approved Neutral Palette color. The seal illustrations shown here are watermarked as examples only and are not intended or authorized for any use. To request prepared digital art of the Wake Forest University seal, please contact Reynolda Campus Communications and External Relations.